Hello Everyone, it has been awhile since I have posted anything new on my page so here is a little something. 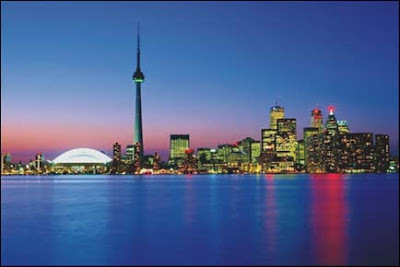 I found this picture on the web of the downtown Toronto skyline at night. The water is so still with the city light reflecting off the surface. It almost looks like an ice surface. Very cool pic! To me, this is cool site in the big city but, I wonder what a Torontonian would say if I showed them this picture? I am sure that most people who live in Toronto probably would never think too much about this kind of thing. Just like the way that most Toronto natives would take for granted that the CN Tower is just another tall building! Oh well, I can just admire it as an outsider. I just think that Toronto is really cool city! Toronto is one of my favorite cities that I've been in. In fact, I love Ontario. I used to tour up there every year with a traveling stage show and we'd spend about two weeks of one nighters with usually a week off in Toronto. One place in Ontario that I haven't been is Sarnia. Sarnia Bayfest 2010 Country Acts Announced.